Tuesday was a pretty busy, but incredibly exciting day for us at Escentual! It was the day of our very first fragrance event, and we hotfooted it to London in the morning to soak up a bit of the beauty atmosphere in the capital before attending the event in the evening. Between covering ourselves with scent and sampling dozens of different textures and colours, we were lucky enough to have a chat and product run-through with the extremely charming Daniel Sandler – and, if possible, we fell in love with Daniel and his products even more. Daniel ran through each and every one of his products himself, explaining his inspiration and intention in a completely absorbing and passionate way. Its so clear to see that he truly listens to what women want from their cosmetics, and incorporates these desires alongside his own personal discoveries from his years as a professional make-up artist. Daniel is also constantly innovating – there are many new products in the pipeline, so watch this space! – Make your daytime Daniel Sandler Eye Love it crème eyeshadow application more intense and dramatic for the nighttime by applying the Daniel Sandler Eye Delight loose powder straight over the top. Eye love it acts as a perfect primer, bringing out the metallic intensity of the shadow. – Use the Watercolour Crème Blusher and Watercolour Crème Bronzer as both a cheek and a lip colour. Simply apply a slick of gloss over the top to seal in the colour. – Prime your Daniel Sandler Base Brush with water or moisturiser to ensure a more even and natural application of your foundation. This also ensures that the brush doesn’t soak up all of the product! – Use the Daniel Sandler Retexturising Face Primer SPF 25 to prepare the entire face for makeup application – including lips and eyelids. The formulation fills in fine lines, wrinkles, and pores, making your makeup sit perfectly and last for much longer. – Increase the coverage of your Daniel Sandler Waterbase Foundation by mixing it directly with a swatch of the included concealer before applying. The density of the concealer makes for a more opaque finish. 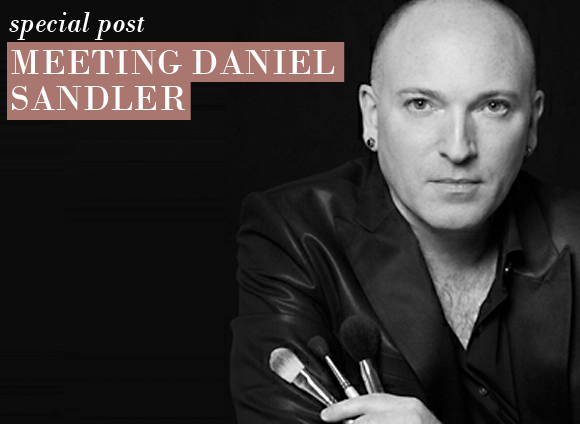 Take a look at our Daniel Sandler exclusive the Daniel Sandler Watercolour Crème Bronzer in Riviera, and take a look at the entire Daniel Sandler range right here. Very smooth and not at all sticky. Easy to apply and the colour lasts all day and looks totally natural. Love it! This entry was posted on Thursday, June 2nd, 2011 at 8:00 am and is filed under Hints & Tips, Make-up. You can follow any responses to this entry through the RSS 2.0 feed. You can skip to the end and leave a response. Pinging is currently not allowed. Little things really make a difference – my favourite tip is to prime your foundation brush with moisturiser or water. I’ve been doing it ever since Daniel mentioned it!